This World Cup is only getting better for me. There I was, tired and patiently waiting at the Cape Town airport for my friends to arrive by a later flight. We were to hire a car and head to green point, the venue for the Spain - Portugal round of 16 clash. Bored, I looked around hoping to find a friendly face that I could chat up, which is my recent practice here at the World Cup. As I looked towards the Car Hire section, I noticed a tall, fit figure of a man that made my brain waves fire a little more than usual. I wasn't really excited at that point of time, and my eyes scanned the rest of the airport lazily. Something, thankfully, made me return my gaze to the gentleman still standing at the same spot, entirely on his own. That's when I burst to life. I strode straight to him, partly to get a closer look and partly to introduce myself. 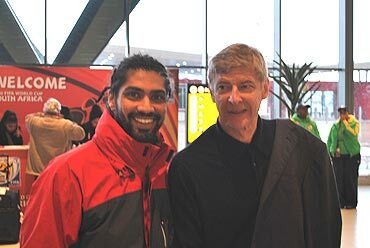 I felt no shyness or fear, just confidence and joy as I grabbed Arsene Wenger's hand and shook it vigorously and held his shoulder tight. This man, a superstar for a football fan from any part of the world, was down-to-earth and warm as we chatted about football in India and its future. Interested in me Mr. Wenger? "Its struggling sir, but our team is coached by a very able man -- Bob Houghton. Do you know him?" 'Ah yes " he said, as he shook is head knowingly and implying that we were in good hands. "We have incredible talent at the school level, but we lose them all to education and other careers..."
My good friend Vishal took these pictures, and he is in the other one. 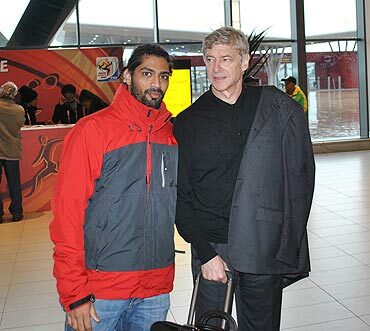 Vishal told him that I play league football in Mumbai and am a huge fan of Arsenal. But, no, he didn't offer me a trial! 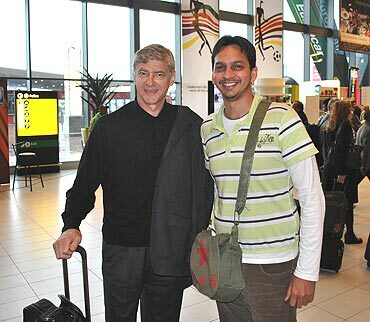 Wenger to come to India soon? Vishal asked him when he would be heading to India, because he had mentioned a while ago in the media that he would. As a few people noticed what was going on, a small crowd gathered, took pictures too and Mr Wenger soon grew a little uncomfortable. He carried on up the escalator, with my spirit soaring as well.